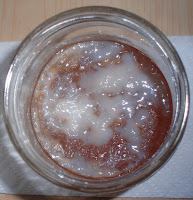 My first DIY SCOBY experiment has now come to an endend! Although from the side it looked like two cultures had actually grown, it was just one. Because the top layer was younger than the bottom layer, the top layer had a lighter, cream color, compared to the darker brown color of the bottom layer. The edges (but not the center) of the SCOBY separated a bit. However, the two layers were pretty cemented together, and they seemed all cozy and comfortable right next to each other, so I guess together as one they were meant to be. 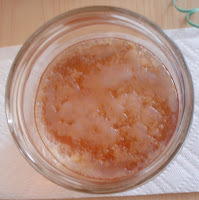 The kombucha tea itself was definitely way over-fermented! It tasted like kombucha tea all right, but it was so acidic that you would not want to drink more than sip (taste-wise and health-wise!) The pH of the tea was around 1-2. I used some as strong starter tea, and I also mixed some regular kombucha tea with the over-fermented KT (so the pH wasn't as low), so I could store some extra SCOBYs that I want to give away in the fridge. This experiment was much more successful than I expected, and it was wonderful to see the kombucha culture develop day by day! It's looking like two SCOBYs to me! Are there TWO mothers forming? If you want to keep a back up culture safely away, if you're going on vacation, or if you just need a break from brewing, you have several options. 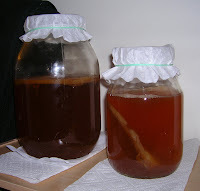 One method is to brew a batch like you normally would, and then leave the SCOBY in the tea, with a breathable cover. Over time the tea may become over-fermented and very acidic, but you can use this as your starter tea. (Happy Herbalist also lists several other uses for extra kombucha). Depending on how long you are storing the mushrooms for, you should occasionally add sweet tea to the container, as the liquid evaporates over time. This method is ideal for the health of the cultures. 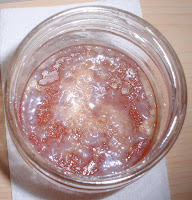 Refrigerate your kombucha mushroom in a glass jar with some unflavored kombucha tea. Or kick-start the brewing process for several days to get the pH down, and refrigerate the mushroom in its brewing container. This method can be used if you are storing your mushrooms for more than a few months. -This will make your kombucha culture dormant. 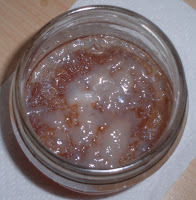 It won't be completely inactive, but the SCOBY will be active at a very slow rate, and it can keep this way for months. -I recommend keeping the lid loosely covered so that CO2 doesn't build up and so the top doesn't pop off. 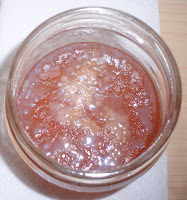 -Consider giving the SCOBY some fresh air/oxygen by opening the lid every now and then. If the kombucha has become/smells really acidic and the SCOBY has been in the fridge for awhile, I sometimes add a little sweet tea to the kombucha (sweet tea ratio: 1 quart water:1 tsp (4 g) loose-leaf tea:1/4 cup (50 g) sugar) to give the yeasts something to feed on. -However: when you start brewing again, you need to remember that the TEMPERATURES NEED TO BE THE SAME for the sweet tea and the SCOBY, because hot temperatures can kill the mushroom. The easiest way to do this is to let your hot sweet tea solution cool down overnight to room temperature, while letting the culture that used to be in the fridge warm up overnight to room temperature. 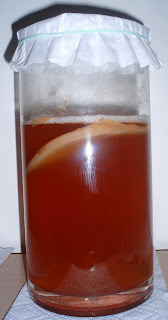 -When you start brewing again, it may also take a few cycles for your SCOBY to kick back into full gear. It's not recommended to freeze your kombucha culture but it is possible:-It is recommended to use the "fast-freeze" setting of your freezer so the SCOBY will be frozen ASAP. If your culture is frozen too slowly, crystals may form which may damage the culture's cells. See more information here. If something unfortunate happens and you need a new culture- try asking a friend for a new mushroom, try growing your own, or try any of these other options. Although glass brewing containers are best for brewing kombucha tea, you may use other containers. Because kombucha tea is acidic, it should not be made or stored in certain ceramic and painted containers or containers made with lead crystal, which can contain toxic components that may leach into the tea. You should also not store tea or cultures in metal containers, and some plastic containers may leach chemicals into kombucha (1). However, food grade plastic, which have a number 1 or 2 inside a triangle on the bottom, and containers that are used to brew beer may be used (2). According to Harald W. Tietze in his book Kombucha: The Miracle Fungus (1996), porcelain is another suitable brewing material. Brewing containers with large surface areas will ferment and brew more quickly, because more of the tea is exposed to oxygen. However, containers with large surface areas will also increase the loss of liquid to evaporation (3). -The FDA acknowledges that kombucha tea and home brewing can be safe but also lists some warnings here. However, under sanitary conditions, kombucha tea is perfectly safe! Problems such as mold are rare. Proper cleanliness practices in the kitchen are usually good enough to brew. In addition, kombucha cultures have antimicrobial properties, helping them to resist infection and contamination. More info on that later!